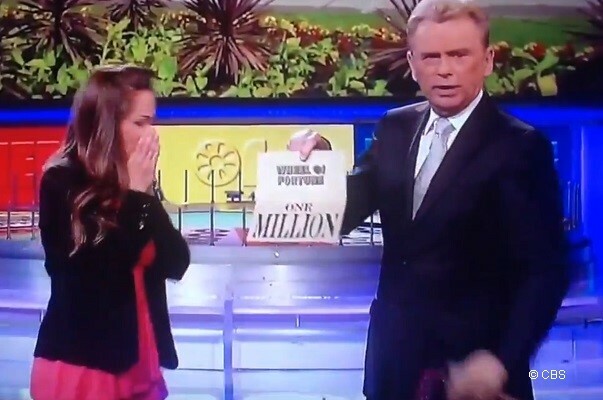 Culver City, CA – On Thursday night, Autumn Erhard became the second contestant to win the one million dollar grand prize on Wheel of Fortune. Dominant through the entire game, Erhard finished the regular round of play with more than $30,000 in cash and prizes including trips to Belize and Arizona. Comparatively, her competitors finished with $2,000 and $1,000. She also carried the “Wild Card” with her into the bonus round, which gave her the opportunity to guess an additional consonant. Although there were only a few letters revealed, she solved the final puzzle, “Tough Workout,” with ease. Erhard’s big win came during Wheel of Fortune’s “Celebrating 30” theme week, which highlights the game show’s 30th season with contestants who have a “30” in their lives. She was a part of the week because she is 30 years old. The one million dollar grand prize wedge was added to the Wheel in 2008, at the beginning of the show’s 26th season. If a contestant collects the wedge, solves the puzzle and makes it to the Bonus Round without hitting bankrupt, the top $100,000 cash prize is replaced by one million dollars on the Bonus Round Wheel. The first million dollar grand prize was won by Michelle Lowenstein, in October of 2008. Erhard is an animal pharmaceuticals sales representative from Laguna Niguel, CA. The University of California, San Diego, graduate is recently engaged and hoped that by being on Wheel of Fortune, she would win some money to help plan her wedding. She was joined on set by her fiancé, Joey; father, Harold; and mother, Francine. They were just as shocked as she was. “No one could believe it! They were just off stage and couldn’t see what my prize was. They were celebrating the fact that I solved the puzzle,” said Erhard. “They kept asking me how much I won, and I had to keep repeating it because no one believed me at first. This season, Wheel of Fortune’s 30th, is shaping up to be the show’s biggest-ever for prize giveaways. This particular win is a truly a life-changing event for Erhard and her fiancé, who is in construction, an industry hard-hit in the recent economic downturn.